We invite you to add to your favourites the link of our Lambton Doors Virtual Library where you will find our latest version of our Architectural Catalog. Please add the LINK OF THE LIBRARY to your favourites, not the link of the Architectural Catalog itself. 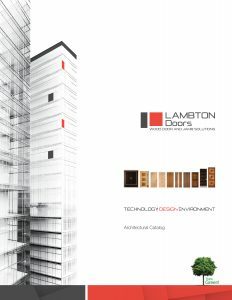 When accessing our Catalog via our Library you will always consult the latest version of our Online Architectural Catalog. Hand Left Vertical Menu to surf the Catalog. Bottom Horizontal Menu for actions. NOTE concerning DOWNLOAD and PRINT with Flipping Book. We invite you to download FlippingBook App on your mobile device, if you wish.